"Hey every dad is entitled to one hideous shirt, and one horrible sweater. It's part of the 'Dad Code'." 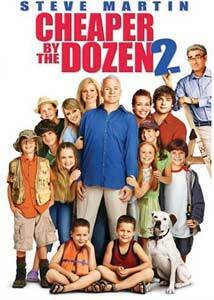 In this sequel to Cheaper By the Dozen, all 14 members of the Baker family are growing up, with Charlie (Tom Welling) going to college and working part-time, Nora (Piper Perabo) happily married and expecting a baby, and Lorraine (Hilary Duff) graduating and preparing for an internship with a prominent magazine. The younger kids remain just as mischievous as ever. With a potentially boring summer on the horizon, parents Kate (Bonnie Hunt) and Tom (Martin) Baker decide to vacation at the lake they used to frequent. Once there, they discover that the area is practically owned by old rival Jimmy Murtaugh (Eugene Levy), and his almost equally large clan. After a series of verbal wars and attempts at one-upsmanship, the Baker and Murtaugh families square off in a final competition to settle their feud once and for all. There are two distinct types of Steve Martin roles that have been in play for the last 10 years or so. On the good side, there's Dramatic Steve Martin who excels in films like The Spanish Prisoner and the recent indie picture Shopgirl. On the other, we get Family Comedy Steve Martin, an actor that hasn't delivered a solid, consistently funny performance since Father of the Bride. A naturally gifted physical comedian, Martin simply tries way too hard here, making facial gestures and comments that have "approved for all audiences" written all over them. While Dramatic Steve Martin is quite impressive and appealing, here's hoping Martin decides to go back to his roots and make a no-holds-barred, R-rated comedy sometime in the near future. When Eugene Levy is playing straight man to Martin's goofy jokester, you know your movie's in trouble. Granted, Levy isn't a zany, physical comedian, but he simply has to be given a chance to let loose at some point in every film he's in. It's no surprise that the writers felt the need to take the Baker family away from their house for a second go-around, and giving Tom a rival in Levy's character during their vacation is a nice concept. However, why use Levy as said rival if his lone job is to be an unfunny, smug jerk? If there was more wit, and just plain laughs to be had along the way, such errors would be forgivable, but Cheaper By the Dozen 2 has none of that going for it. Image Transfer Review: The disc's anamorphic widescreen presentation does a fine job of capturing the lakeside setting that dominates most of the film. Details are crisp, and colors are rendered well enough to keep things realistic as well. Fleshtones are accurate, with the contrast and black levels remaining consistent throughout. There weren't any noticeable print flaws in either this, or the equally impressive pan-and-scan presentation on the flip side of the disc. Audio Transfer Review: The Dolby Digital 5.1 track is also very nice, but is a typical family comedy mix. The dynamic range is wide, but there aren't really any action sequences to warrant a more enveloping audio experience. There's very little bass presence, but the LFE does make a few cameo appearances. Dialogue clarity is never an issue, as it is seamlessly integrated into the rest of the mix. Inside Look: Flicka - Behind-the-Scenes look at the upcoming film. Inside Look: Aquamarine - Behind-the-Scenes look at the upcoming film. Extras Review: The decent extras collection includes two theatrical trailers for Cheaper By the Dozen 2, one for Big Momma's House 2, and teasers for the upcoming Fox pictures, Flicka and Aquamarine. There are three featurettes, with the first, Fox Movie Channel presents Casting Session, running for eight minutes and going over the casting of the "new" family in Cheaper By the Dozen 2. Camp Chaos is 10 minutes of more behind-the-scenes footage, as well as talk about how difficult it was to control the child actors on the set. A Comedic Trio runs around five minutes and is mostly interviews with the cast, who talk about working with Steve Martin, Bonnie Hunt, and Eugene Levy. There's an audio commentary track that features director Adam Shankman discussing the ins and outs of the production. The track is a rather interesting listen, as many of the stories Shankman tells are very funny and candid. An unfunny, yet goodhearted family film, Cheaper By the Dozen 2 is another example of the fluff that Hollywood consistently churns out these days. The Steve Martin vehicle leaves much to be desired, but Fox's DVD is technically solid and has a few extras that those who enjoy the film will want to spend some time going through.